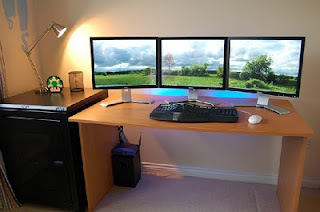 I am currently finalizing my wishlist and this item is definitely on top of my list: a tri-monitor rack mount computer. I have tried to make my simple living room in Manila fixed and turned half of it as a study area and an office in one. This item on the other hand is what I really want and what I really pictured in mind! Second in my list is a 3-month membership fee in an old-school gym, and when I mean old school - more on free weights and more than 2 hours of cardio for fat burning. This will definitely help me get back in shape and lose the weight I gained over the past two years!